The best time to prepare your plants for winter is from October and early November. South Texas communities typically get their first frost around the second week of November, though in some cases, frost can appear in late October. Though the area only experiences mild winters, it’s still worth winterizing your landscape. There is no such thing as a typical winter, and the unpredictability of the weather means that temperatures can drop to freezing or near-freezing on a daily basis. Keep in mind, too, that plants can get damaged especially at temperatures below freezing. Cold temperatures are often accompanied by strong winds, and protecting your plants from strong winds is the key to winterizing your landscape. These winds are usually dry, resulting in low humidity that can cause plants to dry up. Frost and freezing temperatures don’t usually last very long – at most, these last overnight. But plant owners should note that several continuous days of freezing temperatures have been recorded in South Texas in the past. Temperatures rarely fall below 15°F throughout most of the state, but they can dip much lower. Get ready for the possibility of fluctuations in temperatures. It’s not uncommon for warm weather to be followed by freezing temperatures within a span of only a few hours. This contributes greatly to plant injury in the winter. 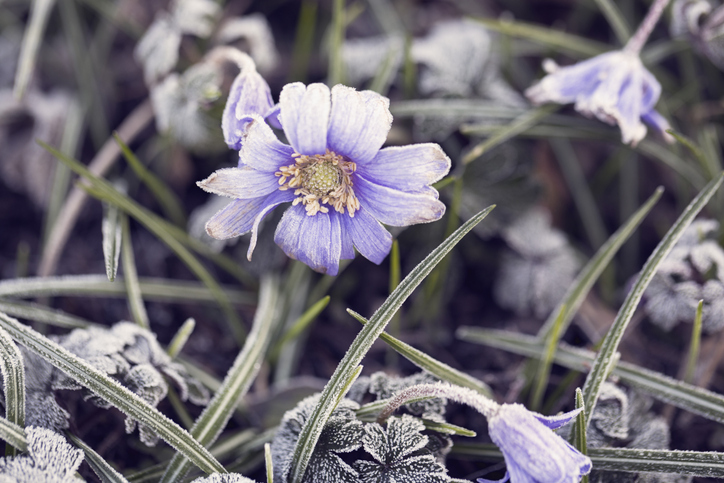 Signs of cold damage usually include dead patches on your lawn, browning leaves on your evergreens, the progressive death of branches and twigs (also known as dieback) on shrubs and trees, and in severe cases, plant death. Plants grown in containers and baskets, like petunias, geraniums, and tomatoes, are vulnerable to cold damage since their roots are exposed to the extremes. Hardy plants that are normally grown in the ground may not be as hardy when kept in containers or baskets. Move containers and baskets away from windy exposures, particularly the north wind. Keep them in areas with overhead cover. Eaves, areas underneath trees, and covered patios can help retain heat. Plants like aspidistra, nandina, and certain species of holly are extra hardy and don’t need to be moved from windy exposures, except in cases of severe and prolonged freeze. Tropical and tender plants like gingers, bananas, and elephant ears are especially vulnerable to plant injury when the weather fluctuates. Place them inside a greenhouse and other protected areas. You can also move them indoors – if your home has adequate lighting and favorable conditions that are ideal for plant survival, then it will serve as a good storage area for the winter. If your home is unsuitable and your space is limited, you can move your containers and baskets to a spot near the garage door or a similar spot where you can quickly move them inside during freezing weather. When developing a landscape plan, keep in mind that tender plants should be positioned in such a way that they will not be visible until after their frost damaged portions have been trimmed. You can plant them within or behind evergreen shrubs, or behind fences, walls, and hedges. Water your plants thoroughly before the temperature drops to freezing or below-freezing temperatures. Water displaces air in soil interspaces, making them much slower to cool than air. Moreover, moist soil usually stays warmer than dry soil. Wash off any frost from the foliage before sunlight strikes it. This helps minimize damage. In case of light frosts and freezes, you can leave the sprinklers on. Water temperature typically doesn’t fall below 50°F. A sprinkler left on at temperatures above 26°F will usually maintain above freezing temperatures. However, don’t use this method in low temperatures or during prolonged bouts of freezes. Otherwise, ice will collect on your plants and cause more damage. You can also build protective frames and coverings for special plants. Although this can be expensive and time-consuming, it can help protect plants that are either fragile or that hold sentimental value. If you’re looking for ranch and residential properties in South Texas, Desert Flower Realty would be happy to assist you. Call me, John Walker, at 361-449-2051 or send an email to DesertFlowerRealty(at)DesertFlowerRealty(dotted)com.